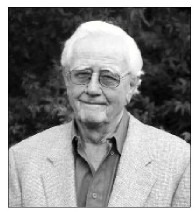 In the 1960s the founder Leif Zars, built his pool in Terrell Hills, an expansive soil condition area, using a common beam pool approach. It was crushed and completely failed! The clay filled soil expanded with enormous pressure on the pool causing the failure. As an engineer he took to solving the problem and has applied his solution to the Gary Pools Method since. 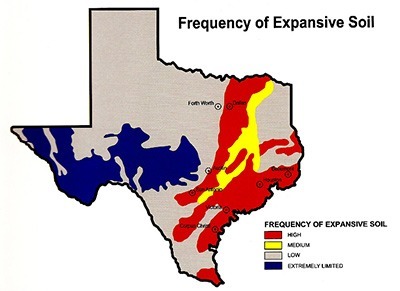 Central San Antonio and areas such as Alamo Heights, Terrell Hills, and around IH35 towards New Braunfels suffer from some of the worst Texas soil conditions. Unfortunately home foundations repair companies are very busy in these areas. If soil in these areas are tough on a foundation, imagine how tough they are on a pools structure! Many structural changes where made, the most significant was the addition of the cantilever beam. By elongating the beam, structural rigidity was increased by over 800%. The elongated beam doubles as a integrated walkway, adding value to the project. In a sense, you get structural strength that doubles as a walkway around the pool. In addition, the coping and tile no longer fail do to adjacent decking movement. 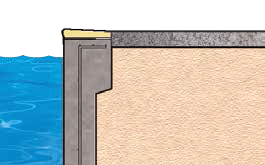 The cantilever insulates the coping and tile from any stresses applied by surrounding structures. Not strong enough for expansive soils. Beam is primarily underground, providing no walkway. 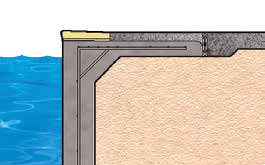 If adjacent deck moves coping failure is much more likely. 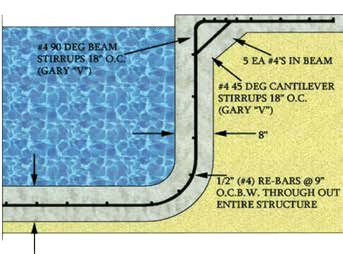 Truly pioneering the swimming pool construction process, Gary Pools’s innovative solution to extream expansive soil conditions can be seen via the U.S. Patent filled in 1963!